Two 50 metre track slabs have been developed from high strength concrete using Shinkansen technology of Japan. Delhi, Metro Rail News: The National High-Speed Rail Limited (NHRCL) create training tracks for India’s first bullet train project at the High Speed Rail Training Institute (HSRTI). 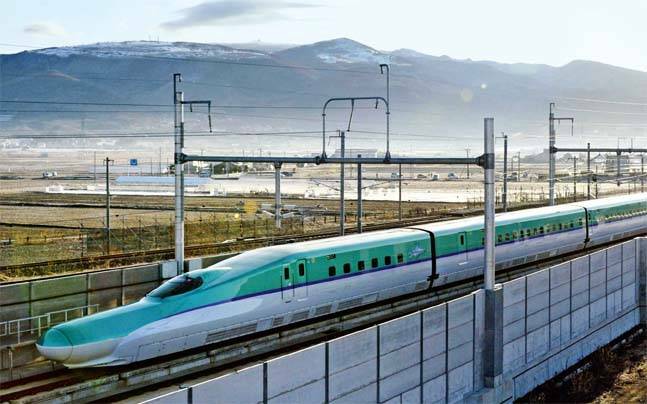 To train staff for the operations of the Mumbai-Ahmedabad bullet train project, two 50 metre track slabs have been developed from high strength concrete using Shinkansen technology of Japan. The training tracks, which include 50 meters for straight line and another 50 metre for the curved line, which is setting up the High Speed Rail Training Institute (HSRTI) in Vadodara, Gujarat. The High Speed Rail Training Institute (HSRTI) is being set up to train manpower in high speed rails. The High-Speed Rail Training Institute (HSRTI) being set up over a land area of five hectares on the campus of the National Academy of Indian Railways (NAIR) is being developed at an estimated cost of Rs 600 crore. Out of this, an amount of Rs 38 crore will be spent in phase one of the project. In December 2018, Deputy Chief Project Manager Anupam Awasthi told that in the first two phases of the project, the NHSRCL is developing the hostel building and establishing the slab track for training. The slab track is being set up at the institute to train those who will be recruited by the corporation for operation and maintenance of the Mumbai-Ahmedabad bullet train. “Unlike the sharp curves that could be seen in conventional Indian Railways, the radius of the curve on the bullet train corridor will be around 6000 metres. This has been done considering the fact that the bullet train will run at a speed of 320 kmph“. he added. As India lacks the technology to manufacture slab tracks, a total of 20 slabs were imported from Japan last year to train people at HSRTI. Additionally, 200 metres rail of JIS (Japan Industrial Standard), 13 mm diameter rebar have also been imported from Japan.